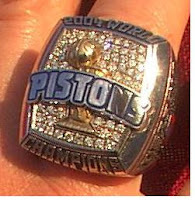 The Rabbi with a Blog (Rabbi Jason Miller): Pistons Bling for $15,000! Proving once more that you can buy anything on eBay, there is a 2004 Detroit Pistons World Championship ring up for auction right now. The starting bid is $15,000 and the owner of the ring is listed as being from White Lake Township. Just my personal opinion, but I think that if the owner of the ring were smart then he'd wait a couple weeks until the Pistons win another championship before auctioning the ring. It would be interesting to know who's ring this is and why they want to part with it.